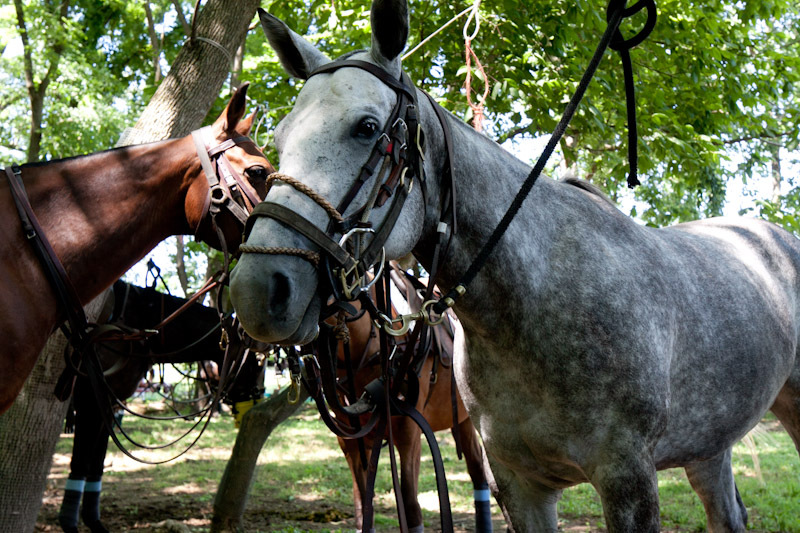 When fitting your bridle to your horse, always make sure you can slide your hand vertically through the throatlatch, and that there is plenty of room for your horse to arch his neck, breathe, etc. This strap is just a safety strap if the bridle should ever happen to come over your horse’s ears. The throatlatch will keep it on long enough for you to stop and dismount. The brow-band should lay flat against the forehead. Make sure it is not so tight that it pinches the head-piece or brings it forward at all. The noseband should be snug, but loose enough that you can fit two fingers between the leather and the horse easily. 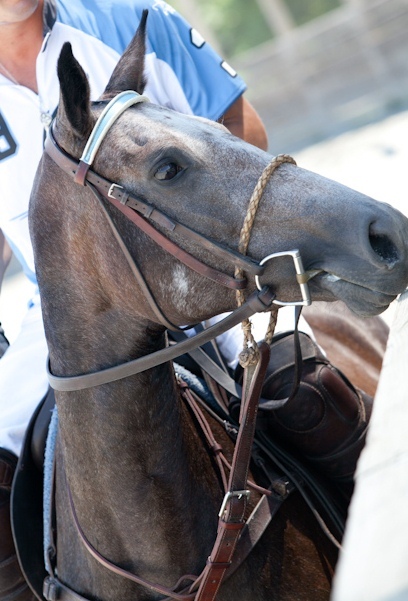 If a drop-noseband is used, the same rule is applied. The fitting of the bit is a hotly debated topic and every professional will have their own standards, and every horse will have his preferences. No two riders are the same; no two horses are the same. Horses’ mouths can vary in the length of the bar (the space between the incisors and the molars), the thickness of the tongue and the height of the mouth between the tongue and palate. Also, if there is any scarring from previous injury, or broken or cracked teeth, special consideration needs to be taken when finding the correct bit. The three main concerns when fitting a bit is how high it sits in the mouth, the width of the mouthpiece and the diameter of the mouthpiece. In the hunter/jumper arena, bits are usually fastened high enough in the mouth that two or three wrinkles appear on the cheek of the horse. In polo, I prefer to let the bit hang low enough in the horse’s mouth that no wrinkles appear but high enough that it does not hit the horse’s teeth. This lets the horse ‘pick up’ the bit with his tongue and carry it where he finds it comfortable. This increases the responsiveness and communication with the horse. Imagine the difference between a steering column in your car where the power steering is well lubricated and the column fits well and a steering column without power steering fluid that’s been jammed into a tight fit. On the other hand, a bit that hangs too low in the horse’s mouth can encourage him to slip his tongue on top of the bit, making it ineffective. Whatever the case, the golden rule is that when you apply pressure to the reins, the bit should be able to move against the horse’s lips and that the horse does not show signs of discomfort. If the bit is fixed too high in the mouth, the constant rubbing will desensitize the corners of the mouth. It will also not give the horse the release he is looking for when he obeys the commands. If the rider pulls the bit to stop, and the bit is fixed high in the mouth, the horse will continue to feel pressure after he has stopped. Another thing to consider is the width of a bit. The average bit is 5” to 5 ½” but the basic rule of thumb is that, correctly placed in your horse’s mouth the bit should only have ¼ – ½ inch of play between the horse’s lips and the ring. Any bigger and the bit will see-saw across the horse’s tongue and can bruise the bars of the horse’s mouth. To measure a specific horse, insert a wooden dowel or piece of string/bailing twine in the mouth where the bit would sit and mark the edges of the horse’s lips. A bit that is too small will pinch the horse’s lips and cause callusing or cuts. 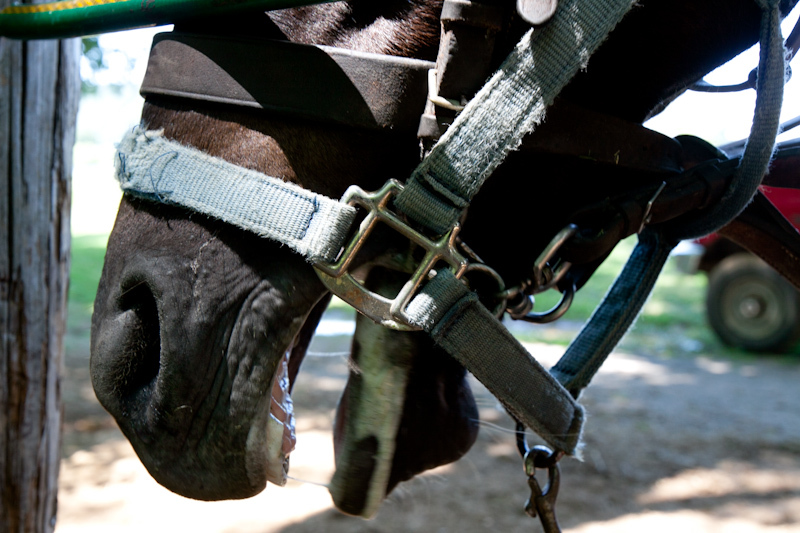 A bit that is too wide will slide through the horse’s mouth when pressure is applied and in the case of a jointed bit, it will cause a nutcracker effect and the joint could hit the roof of the mouth, causing extreme pain. A thin mouthpiece will act like a wire cheese cutter on a horse’s tongue. Although a thicker mouthpiece will spread the pressure evenly, a thick mouthpiece in a small mouth, though, can be crowding and uncomfortable. If a horse is fitted incorrectly with a bit that causes pain for long enough time, it can completely undo their training. I was once given a horse named La Loca. She was a beautiful, delicate, well-bred thoroughbred mare. She was given to me free, because every time someone tried to ride her she would flip over backwards on top of them. I rode her successfully for years afterwards as long as I never put a bit in her mouth. I can only assume she was ridden one day with a bit that caused her so much pain, she threw herself on her back in an attempt to run away. Once she learned that trick, she had a way to get every rider off her back.